While dandelion greens do have a bitter taste, they’ve been part of the Mediterranean diet for years. 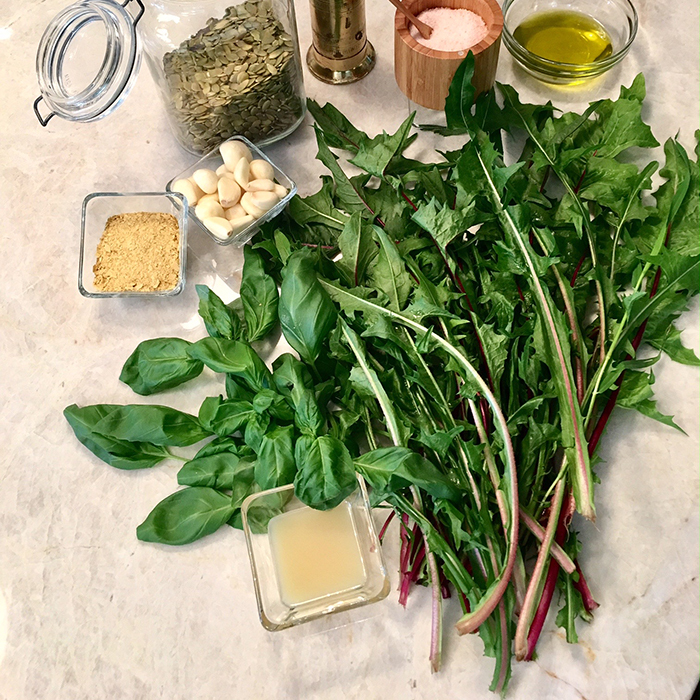 Their flavor is softened when you combine them with other greens: the basil in this recipe masks the bitterness so completely that guests are always shocked when they ask the ingredients and I mention the “dandelion” part. Open your taste buds and give this a try – you won’t be disappointed! Wash and pat dry the dandelion and basil greens. Place all greens in a food processor; start to pulse, then add the garlic, lemon juice and nutritional yeast. Slowly drizzle in the olive oil from the top as you continue to pulse, adding more if needed. Pulse to the texture you prefer - pestos can be smooth (more of a puree) or chunky. Add salt and pepper to your liking. The nutritional value of dandelion greens can't be overstated: they're high in calcium, iron, antioxidants and minerals, to name just a few benefits. They also contain more protein per serving than spinach! Just be sure to buy the greens from your local health food store, as cultivated dandelion greens have a milder flavor than the wild or front-lawn variety.